After 7380 I set up to make an attempt at the Heart Nebula which was in the same area of sky. This is a fairly large object and only just fitted into the field of the apo after much time spent on adjustments. However, when I went looking for a suitable guide star I couldn't find one bright enough to do the job so I eventually abandoned the attempt and went for a less troublesome subject. 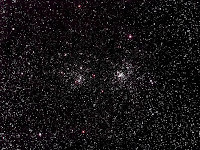 The Perseus Double Cluster has always been my favourite object with a wide-field eyepiece on my Newtonian so I was interested to see what the apo made of it. The Heart Nebula will have to wait for another try. Details: WO Megrez 88 + MPCC. 8x 4 minute exposures @ iso400 with CLS in DSS & XAT Image Optimiser.